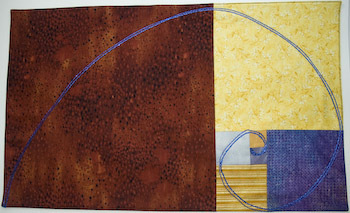 Here’s my latest quilt block. It incorporates an interesting number pattern. The two innermost squares are 1-inch squares, the next is a 2-inch square, the next a 3-inch square, the next a 5-inch square, the next an 8-inch square, the last a 13-inch square. 1,1,2,3,5,8,13. Can you see the relationship between the numbers? (Hint: If I were to continue the pattern, the next square would be a 21-inch square.) This pattern was first identified in the 13th Century by a famous mathematician named Fibonacci. The spiral is made from a shiny ribbon-like thread. I sewed it to the top of the block using a couching foot. 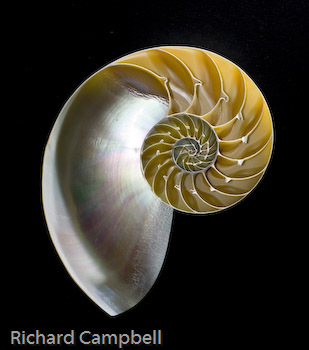 It can be seen in nature in the Nautilus snail shell (like the one to the right). At first I tried a cord (in hunter green), but it pulled the fabric too tight into the spiral and the block wouldn’t lay flat. I ripped it out with the seam ripper. I don’t particularly like to rip out sewing — especially tight stitches. I was listening to a podcast of a writer talking about her work as I sewed (and ripped). I thought about the ripping as a kind of revising. I tend to like revising better than creating an original text. This doesn’t hold for the sewing. I was tempted to just begin another Fibonacci block and toss the one I had ruined with the cording. But I did like the colors of the squares inside the block so I took a deep breath and ripped. For the first time I think I see how the Fibonacci series generates a spiral. Thanks for that. Richard’s illustration is awesome. We heard a great performer Tuesday night–Cooper-Moore–who played his own handcrafted instruments: flute, harp, diddley bow, mouth bow, three string fretless banjo, and balloon. Had to be seen and heard to be believed. Also told marvelous stories about his family and growing up in Northern Virginia. I bought a CD that you might like to hear. We are seeing Vera Wilde, the play Maya directed, tonight. Hope to get to Golden Gate park and see the new California Academy of Science Building. I think we got some good photos of Crater Lake on Monday. Tomorrow night we meet Dennis and his family for dinner. I look forward to hearing the CD and to seeing the photographs from your vacation. I heard a story about the California Academy of Science Building that made me want to see it, too.